Agra Fort : The great Mughal Emperor Akbar commissioned the construction of the Agra fort in 1565 A.D although additions were made till the time of his grandson Shahjehan. It stands at a distance of just 2 Kms. from the majestic Taj Mahal, and is built in red sandstone. 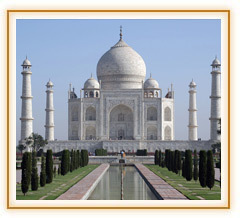 Taj Mahal : The Taj Mahal is a sheer poetry in white marble and its majesty and magnificence are unrivalled. It is the one and only one of its kind in the whole world, which was the ultimate realization of Emperor Shahjehan's dream for his beloved wife Mumtaz Mahal. Sikandra : The Mausoleum of Emperor Akbar represents his philosophy and secular outlook, combining the best of his architectures in a superlative fusion. It was started by Akbar before his death in 1605 A.D, and was completed by his son Jahangir in 1613 A.D.
Mathura : city associated with the most revered of Hindu Gods - Lord Krishna, which is sacred being the birth place of Lord Krishna. 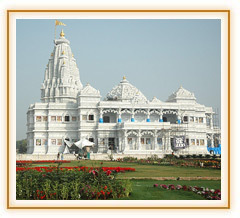 The surroundings 'Braj Bhoomi' is where Lord Krishna is supposed to have grown up. Mathura is one of the most ancient cities of India and is one of the holiest of religious places in the Hindu mythology.Mathura an ancient holy city in India derive its eminence from being the birthplace of Lord Krishna. Situated at a distance of 145 kms from Delhi and 58 kms from Agra in the state of Utter Pradesh, the city is known for its many temples dedicated to the Lord Krishna located at Katra, Keshav Deo, the temples are visited by pilgrims from all over the world. The Temple Dwarkadesh built by Seth Gokul Das of Gwalior in 1814 is arrayed with some ethereal pictures depicting the entire life of Krishna. Vrindavan : where Lord Krishna spent his childhood days , played the flute sporting with the Gopis and where Radhika pined for her lover.